November 28, 2018 at 2:48 pm. Per ESPN, Yellow Jackets assistant coaches have been informed to return from recruiting trips for meetings. Johnson is expected to meet with his players and make his plans known to the team, which finished 7-4 following a 45-21 setback to Georgia on Saturday. The three-time ACC Coach of the Year is expected to be on the sideline for the team’s upcoming bowl game. The 61-year-old Johnson owns an 82-59 mark (51-37 in ACC) at Georgia Tech with four division championships and the 2009 ACC conference crown. 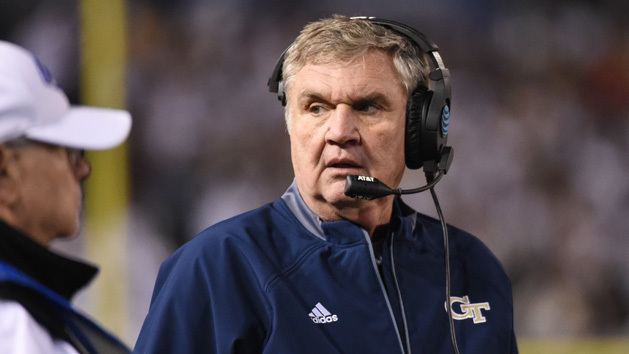 His 82 victories with the Yellow Jackets are fourth in school history, behind Bobby Dodd (165), William Alexander (134) and John Heisman (102). Georgia Tech has posted a 12-11 record over the last two seasons, including 9–7 in conference contests. All told, Johnson posted a 189-98 overall record as a head coach. Prior to being at Georgia Tech, Johnson coached six years at Navy and five at Georgia Southern. He led the Eagles to back-to-back NCAA Division I-AA championships in 1999 and 2000. Los Angeles Chargers offensive coordinator Ken Whisenhunt, who played at Georgia Tech, is expected to be a candidate for the expected vacant position, per ESPN.